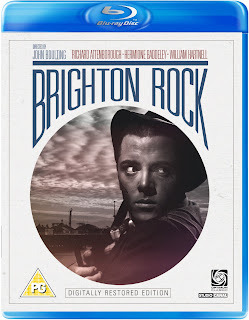 With Rowan Joffe's remake now in cinemas, Optimum have dusted off the original version of Brighton Rock, directed and produced by the Boulting brothers in 1947, and released it on the Blu-ray high definition format. Scripted by Graham Greene and Terrence Rattigan, the Boultings had not only originally shown interest in the serialisation of Greene's original novel back in 1939 but then had bought the rights to the stage version by Frank Harvey, where Richard Attenborough had first taken on the role of spiv gangster Pinkie Brown. Greene had written the novel in 1937 and his tale of racecourse racketeers and criminal gangs swirling around in a dark underworld beneath the bright lights of Brighton reflected much of the inter-gang warfare that had come to public attention in the decade leading up to the release of the film. As well as providing an expose on the corruption beneath the veneer of British respectability, Greene's book was also the first of his cycle of books that deal with religious themes and Brighton Rock's contrasting of light and dark, good and evil arguably goes hand in hand with his proposal that the story is about the contrast between the secular world, epitomised by the character of Ida Arnold and the main character Pinkie's sense of Catholic sin. 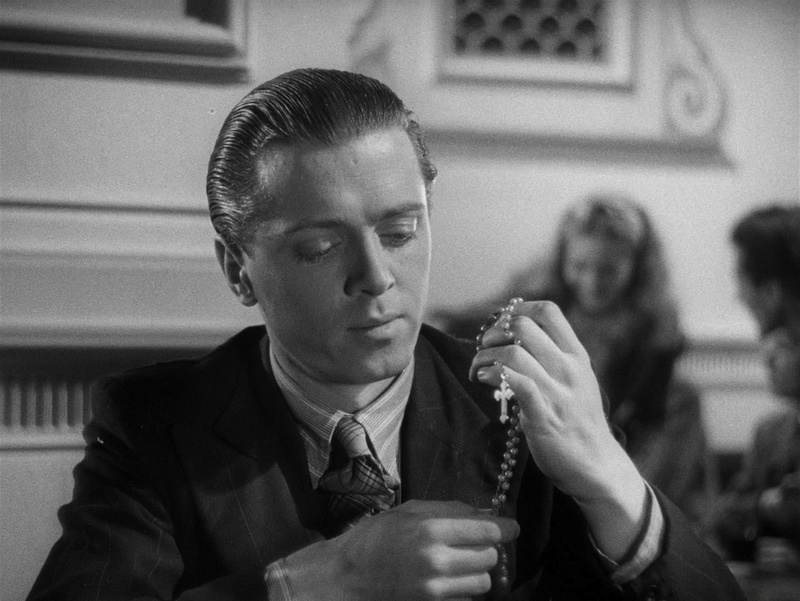 These themes are prevalent throughout the film and also reflect the the uneasiness, weariness and instability of the immediate post-war era where most of Europe was still in moral and spiritual trauma after the Second World War. 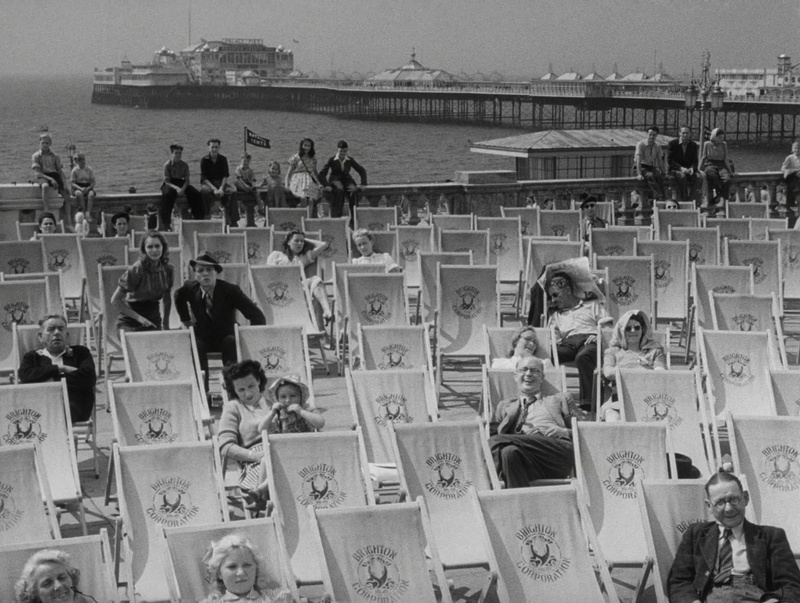 The film of Brighton Rock articulates the deprivations that still existed in the country (rationing only ended in 1954) and keys into the spiv and black market culture, and a sense of general lawlessness because of the increase in juvenile crime, that continued to exist as Attlee's Labour government of 1945-51 attempted to rebuild the country. 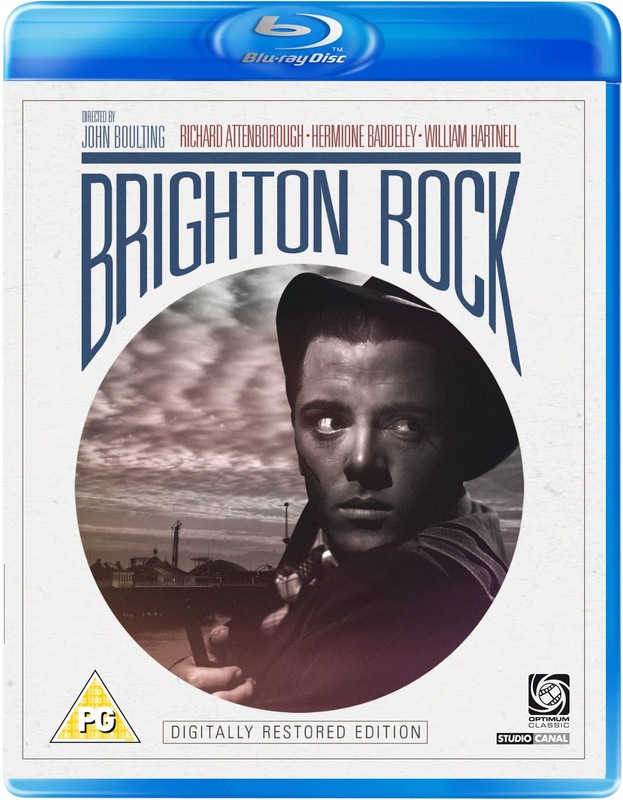 Even the BBFC were worried that Brighton Rock should not condone the criminal activities depicted in the film and they were very squeamish about some of the violence of the razor fights. This worry is perhaps reflected in the caption that appears after the opening credits, a visual representation of the dichotomy between faux British seaside glamour and fun and the churning, dark waves of social unease, advising the audience that the violent, crime-ridden Brighton they are about to see on the screen isn't like that now in 1947. Moreover as the film proceeds, there is further striking visual contrast between the seedy, gloomy, delapidated world of the small time extortionists ruled over by Pinkie and the modernist, brightly lit interiors of the hotel where one of the biggest racketeers Colleoni holds court. The sunny environs of crowded piers are also reversed in the film with images of those piers as empty, rain lashed, badly lit backdrops to suicide pacts and murder. Essentially the film relates the story of juvenile sociopath Pinkie Brown's attempt to revenge the death of his mentor, Kite. 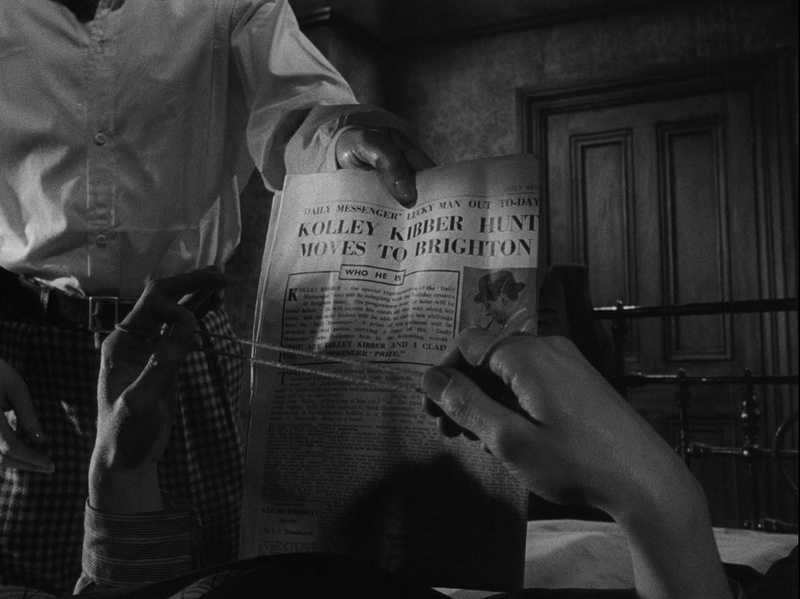 Kite was betrayed by Fred Hale (Alan Wheatley), who comes to Brighton to distribute competition cards for a newspaper, and is then recognised and pursued by Pinkie and his gang. 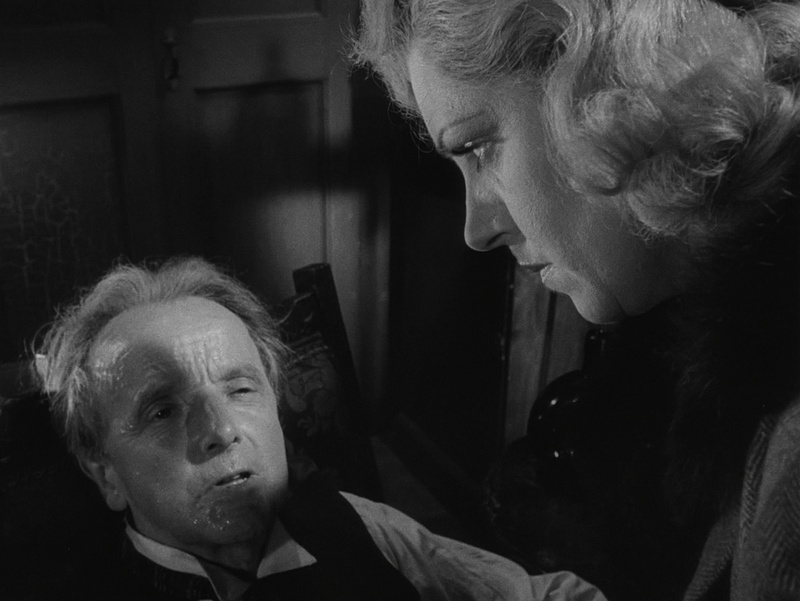 Ida Arnold (Hermione Baddeley), a brassy theatrical artist, befriends Hale shortly before he is murdered. She is determined to get to the bottom of his sudden death, convinced that he did not die of natural causes. 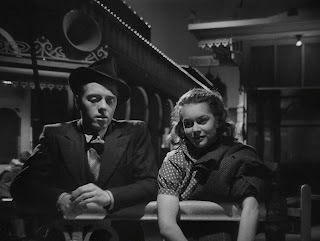 Pinkie's attempts to cover his tracks lead him into an ill-fated marriage to Rose (Carol Marsh), a young waitress who can provide him with an alibi. Ida suspects that Rose is covering up for Pinkie and continues to pursue her line of enquiry, worried for the girl's safety and concerned that justice should be seen to be done. Central to the film's success is the astonishing performance from Richard Attenborough as Pinkie Brown. He captures the character's disdain for the world, against a society that has offered him nothing, and his inner spiritual conflict. In a number of scenes we see him continually playing with a cat's cradle and it seems symbolically to represent his state of mind. He appears to be continually tangling up and unravelling mentally and physically as he wrestles with his own sense of cruelty, misogyny and emasculation and tries to both control the older men in the gang and deal with two female figures who seek to control his destiny. Attenborough is paired with Carol Marsh who brings a naive fragility to the role of Rose and with Hermione Baddeley as Ida, the well intentioned mother figure with a secular moral sensibility that is contrasted with Pinkie and Roses's concept of Catholic sin. Baddeley's robust performance does, however, threaten to veer the film off course on many occasions. "these atheists don't know nothing. Course there’s a Hell, flames, damnation, torments"
There are some very striking moments in the film. 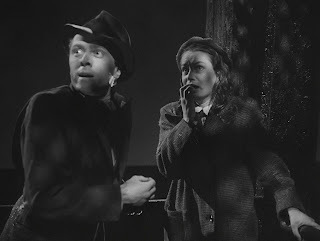 The pursuit and murder of Hale, that takes up a good proportion of the beginning of the film and makes superb use of documentary style location shooting in Brighton, culminates in Hale taking a ghost train ride (called ironically enough 'Dante's Inferno') with Pinkie. The dirty deed takes place in a whirlwind of grotesque faces looming out of the dark of the ride all intercut with shots of Pinkie and Hale's struggle, close ups of their faces and several shots looking down through the rails of the ride into the sea below. This intense scene is dialogue-less and all that can be heard are the screams of the other passengers on the train, the fairground barkers and the rumble of the train. The scene ends with a close up of Hale screaming, the camera whirling and tumbling into a close up of the waves below and maniacal laughter echoing on the soundtrack as more horror characters loom towards us. It also shows some of the incidental details that the Boultings put into the film where, at the end of the ride as Pinkie gets off the train alone, an old man and a young girl, obviously distressed, also disembark. It's ambiguous enough to suggest the possibility that the girl witnessed Hale's death. A wonderful sequence of pure cinema. And look out for the doll he wins at the shooting gallery shortly after the murder. 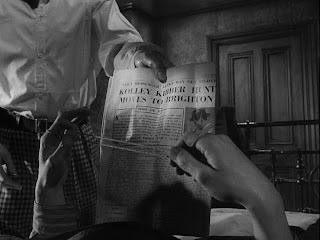 When the scene switches back to the crumbling boarding house and Pinkie's conversation with his associate Spicer (Wylie Watson), Pinkie can be seen pulling the doll's hair out as he lies on the bed, getting more and more anxious as Spicer criticises his motives for killing Hale. When Rose and Pinkie meet on the pier later in the evening, there is a huge thunderstorm while Pinkie interrogates the girl, warns her and secures his alibi. An interpretation of Mendelssohn's 'Hebrides Overture' plays over this as the storm erupts and a downpour covers them, with its lyricism suggestive of loneliness, solitude and the powerful, swelling dark undercurrents of the sea beneath the pier. The camera pans down to Pinkie's hand, concealed in his pocket and probably holding his flick knife ready to threaten Rose if she doesn't agree to what he says. "Come on let's get out of this rain and go inside and listen to some real music" suggests Pinkie, alerting us to the fact that this is not just incidental music on the soundtrack but that it is music being piped onto the pier itself, scoring their lives and underlining the Faustian pact now made between Pinkie and Rose. 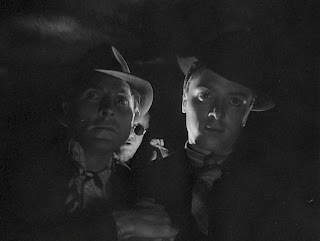 "Why, this is Hell, nor are we out of it"
When Spicer claims that "Pinkie doesn't know when to stop" the film ushers in his growing disaffection and the sympathies of his fellow gang members Cubitt and Dallow. Dallow is played by William Hartnell and he creates a surrogate father figure for Pinkie to reply upon. 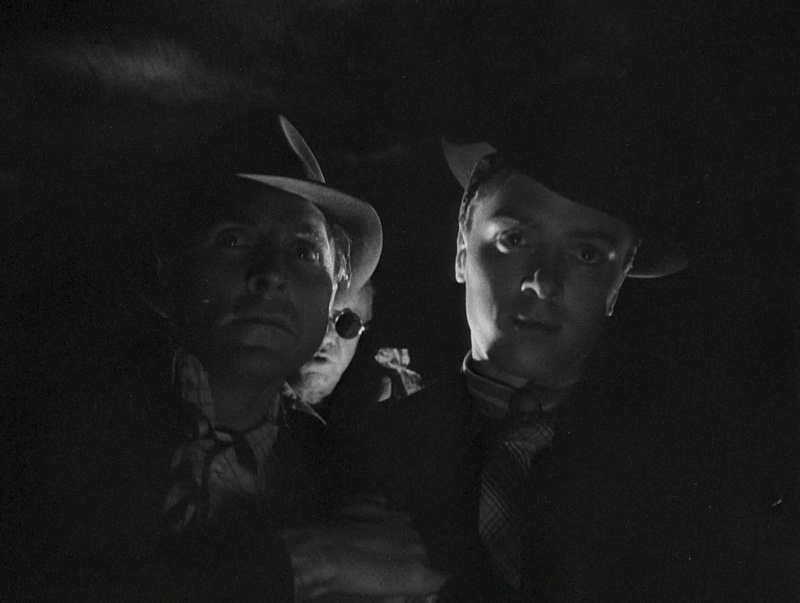 Cubitt sees a very young Nigel Stock, with pencil moustache and a zoot suit, stealing all the scenes he's in. The rest of the film sees Pinkie go head to head with Colleoni in a desperate fight at the racecourse and his first attempt to get rid of the troublesome Spicer. 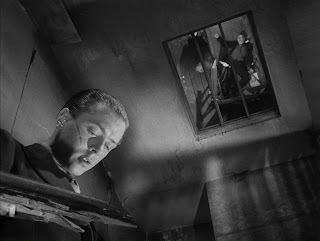 His failure then sees him resorting to push the man through a broken bannister to his death in the boarding house. Spicer's death is wonderfully realised and also features a barnstorming performance from Harcourt Williams as Pinkie's Shakespeare quoting sleazy, drunken lawyer Prewitt, who covers for him when the police enquire into Spicer's death. 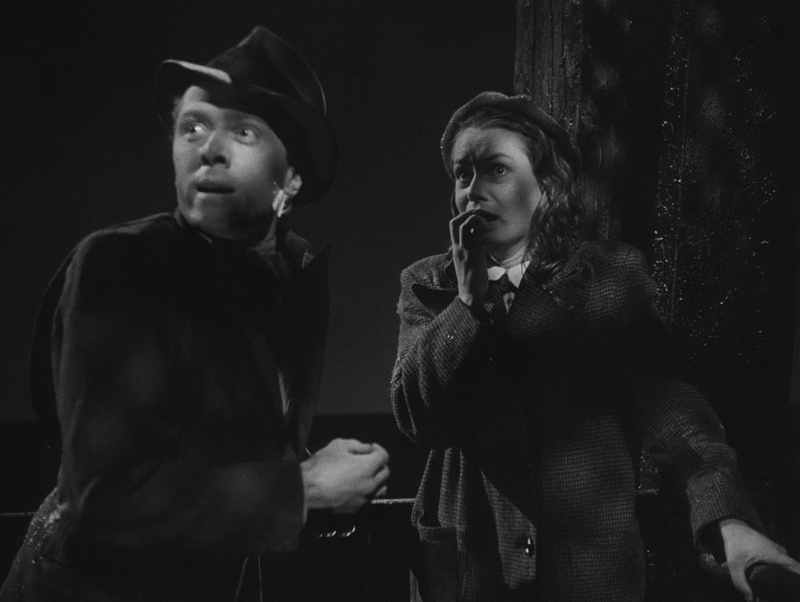 There's a brilliant shot as the camera whip pans from Prewitt's shocked expression to Pinkie's gaze where above him Spicer's crumpled body, lit by a flickering gas jet, is reflected in the skylight above his head. 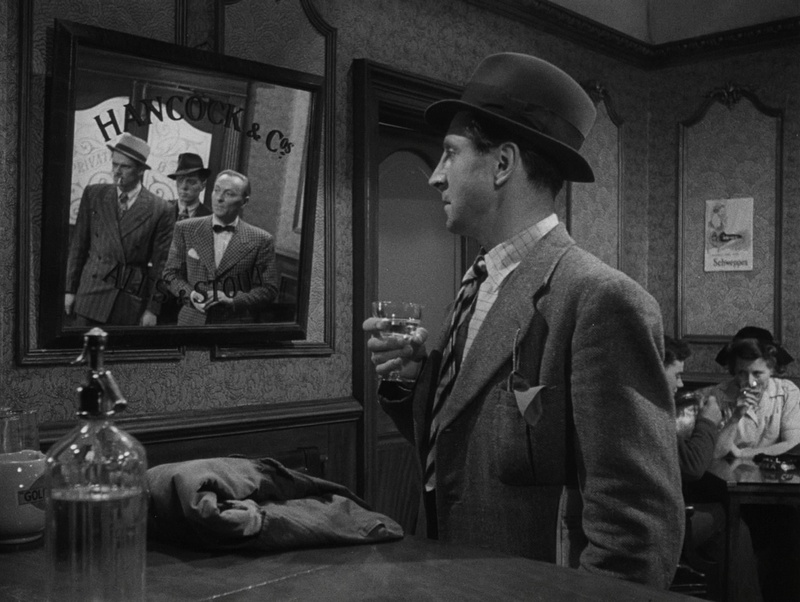 It nods back to an earlier moment in the film where Hale meets the gang in the bar and their reflections are caught in a mirror. He also increasingly recognises Ida Arnold's interference in his affair with and subsequent marriage to Rose. There is a blood curdling moment as Ida performs on the seafront with her fellow promenaders dressed as Pierrot clowns and, as she gaily sings and dances, she spots Pinkie threatening Rose as they both sit in the audience. As Rose informs Pinkie about the brassy Ida, the woman with the big laugh, coming to the tea rooms where she works and asking awkward questions, simultaneously the same highly distinctive laugh (a key use of sound as a subtextual signifier in the film) echoes from the stage. Ida's face falls as they all exchange knowing looks and the couple hurriedly abandon their deck chairs and escape her gaze of horrified recognition. She also spots the couple at the hotel shortly after Pinkie has recorded a message for Rose on a gramaphone record (one which the audience knows, and unbeknownst to Rose, is full of hatred for the girl) and she vows to "save that girl" from Pinkie's evil clutches. Another memorable scene is when Ida visits Prewitt and accuses him of covering up Spicer's murder where, as she tries to reason with him, Prewitt furiously attempts to silence blaring jazz music coming from the neighbouring building by thumping on the wall. 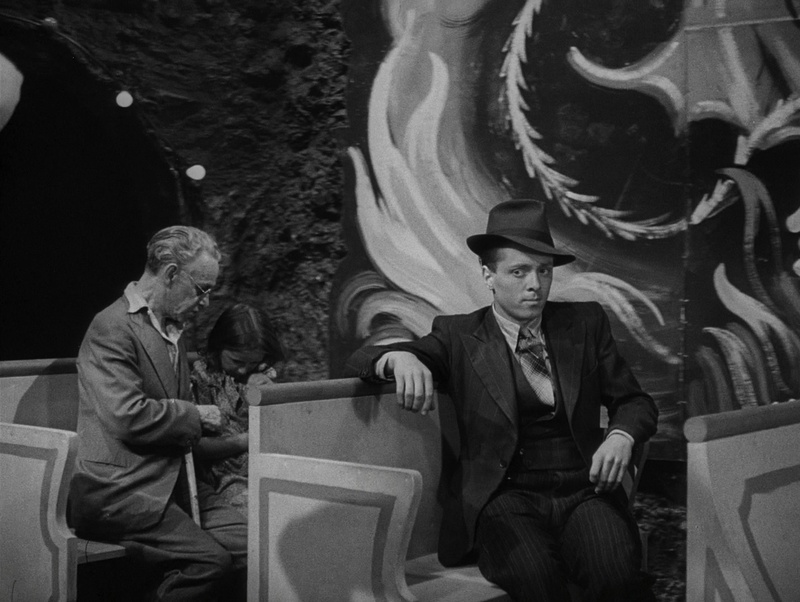 Prewitt philosophically ruminates on Mephistopheles and Faustus query as to the location of Hell and sums up the private agony of his relationship with Pinkie as "Why, this is Hell, nor are we out of it" as well as the themes of damnation and redemption that run through the film. Gradually Pinkie is abandoned by his gang. After Spicer's death, Cubitt takes fright and leaves. Only the faithful Dallow remains and it isn't until the end of the film that he realises that Pinkie has gone too far when he drags Rose off to the pier proposing that they both shoot themselves in a suicide pact. The film climaxes with this scene as the police, Dallow and Ida attempt to prevent Pinkie from killing Rose. Rose, unable to fulfill her side of the pact, throws Pinkie's gun away and Dallow, having warned Pinkie not to touch Rose, thumps him and gives him up to the police. Pinkie, reduced to the status of a frightened child, stripped of all masculine bravado, screams and plunges off the pier as the police close in on him. It's a breathtakingly directed sequence. The epilogue is contentious depending on your view point. We see Rose safely being looked after by nuns in a refuge and maintaining her faith and devotion to Pinkie. The nun comforts her by saying "There is always hope. It is the air we breathe. Love can bring about salvation." The audience knows that this will be shattered when she plays the vitriolic message on the recording he made for her, that denounces her and her love for him. But her faith is preserved as the recording jams on the words "I love you" and substantially recontextualises the original message. You'll find the irony of it is either deeply sentimental or horribly disturbing as the camera slowly goes for a close up of the crucifix hanging on her bedroom wall. The film is presented here as a digitally restored edition and comparing this to the previous DVD release you can see a great deal of improvement in the picture quality. There is a huge amount of detail now viewable in clothes, faces, backgrounds and street scenes. However, much dirt remains on the image in a number of scenes, manifesting as quite a lot of white speckles. 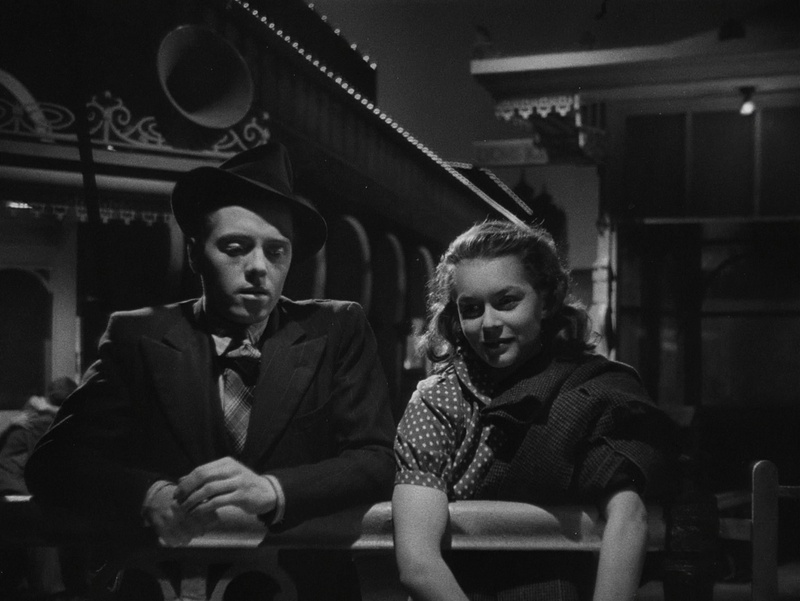 There are also a lot of sequences where the levels of contrast are weak, often reproduced as very grey areas of the picture rather than the pure blacks that a film of this kind demands. While there are many instances where real depth is achieved within the high definition image, overall I felt slightly disappointed with the inconsistencies of the transfer. It certainly could have done with some manual de-blobbing of the white speckles and some of the instabilities sorting out. 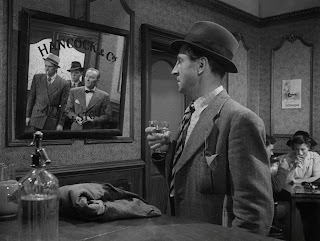 However, don't let that deter you from enjoying a remarkable British film noir and the black and white cinematography of Harry Waxman who captures perfectly the grubby boarding house, the pubs, hotels and piers and offers plenty of very eye catching visual framing and Expressionist composition. Interview with Rowan Joffe - the director of the 2010 remake talks about the legacy of the Boulting brothers classic British film. 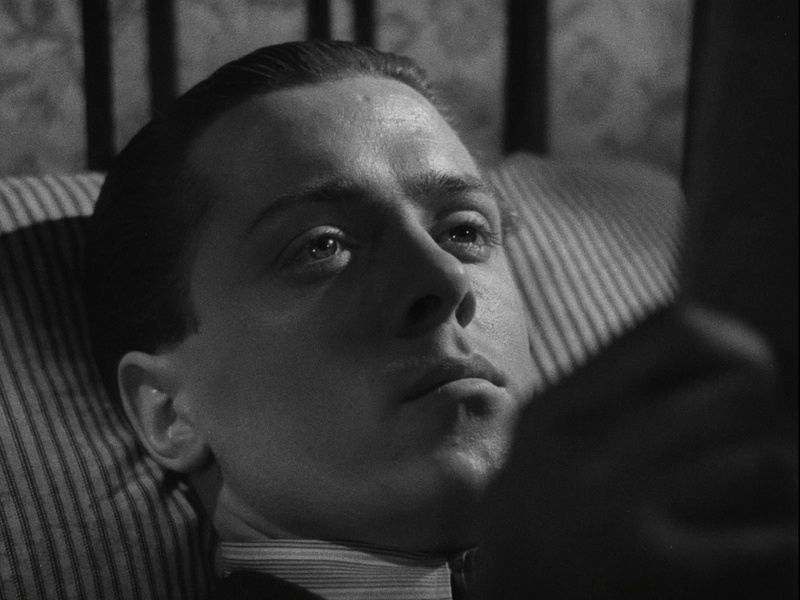 1954 NFT audio interview with actor Richard Attenborough and director John Boulting - this is rather nicely done with a combination of the audio plus stills from the film and additional text captions.